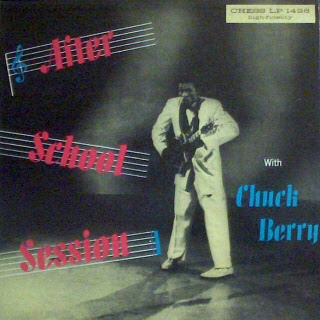 This week’s program is mostly made of non-stop music, with Chuck Berry’s “After School Session” LP, first released on Chess Records in 1957, being played in its entirety. Cette édition consiste principalement en une compilation de musique en non-stop, avec la diffusion de tous les titres de l’album de Chuck Berry «After School Session» sorti en 19570 sur le label Chess. 1. Alma COGAN - "I’m In Love Again"
2. The CATALINAS – "The Catalina Push"
3. Lonnie DONEGAN - "Rock Island Line"
4. Chuck BERRY - "School Day (Ring! Ring! Goes The Bell)"
5. The SOUTHLANDERS - "Ain’t That A Shame"
6. Jackie BENSON - THE ROUNDERS - "Gotta Get You, You, You Off My Mind"
7. Tommy STEELE - "Singing The Blues"
8. Chuck BERRY - "Deep Feeling"
9. Ricky JAMES - "Party Doll"
10. Rex HALE And His RYTHM MASTERS – "Darn Dem Bones"
11. Rory BLACKWELL - "Bye Bye Love"
12. Chuck BERRY - "Too Much Monkey Business"
13. Neville TAYLOR - "Mercy, Mercy, Mercy"
14. Ray STRONG - "You’re Gonna Reap What You Sow"
15. FIVE CHESTERNUTS - "Teenage Love"
16. Chuck BERRY - "Wee, Wee Hours"
17. Marty WILDE - "Angry"
18. Jerry GRIMES - "My Rock And Roll Daddy"
19. Billy FURY - "That’s Love"
20. Chuck BERRY - "Roly Poly"
21. Vince TAYLOR - "Brand New Cadillac"
22. Frank CATHEY - "Witchapoo"
23. The SHADOWS - "Saturday Dance"
24. Chuck BERRY - "No Money Down"
25. Bill FORBES - "Once More"
26. Rex HALE And His RYTHM MASTERS – "Down At Big Mama’s House"
27. Don LANG - "Rock ‘N’ Roll Blues"
28. Chuck BERRY - "Brown Eyed Handsome Man"
29. The HUNTERS - "Teen Scene"
30. Frankie TARO – Ivan GREGORY And The BLUENOTES - "Susy Ann"
31. Suzi MILLER - "Tweedle Dee"
32. Chuck BERRY - "Berry Pickin’"
33. Don WINTERS - "Pretty Moon"
34. Terry WAYNE - "Matchbox"
35. Chuck BERRY - "Together (We Will Always Be)"
36. Johnny FORTUNE - "Alone And Cryin’"
37. Terry DENE - "Baby She’s Gone"
38. Chuck BERRY - "Havana Moon"
39. Adron JUMPER & The WHEELS - "Crawdad Song"
40. Chuck BERRY - "Down Bound Train"
41. Johnny KIDD And The PIRATES - "Shakin’ All Over"
42. Chuck BERRY - "Drifting Heart"
43. SIXTEEN And The SIDEWINDERS - "Full Moon Baby"
44. SIXTEEN And The SIDEWINDERS - "Long Blonde Hair"
45. SIXTEEN And The SIDEWINDERS - "Run Chicken Run"
46. SIXTEEN And The SIDEWINDERS - "Don’t Ask Me Why"
47. SIXTEEN And The SIDEWINDERS - "Wild One"